I have kept dogs for 20+ years. During which time we have owned Dobermans, Bedlington Terriers and Chihuahuas, Biewer Terriers, Toy Poodles and Miniature Schnauzers (or they have owned us, whichever way you look at it). The Chihuahuas were the first dog that we started to breed. My first Chihuahua joined my family and took over our lives 15+ years ago, when we initially purchased Roxi-Pocket, a little teeny ball of fluff no bigger than my Doberman's paw. I had wanted a Chihuahua from a VERY young age, and I am talking early 1970's (long before the Paris Hiltons' and Cheryl Tweedys' of the world brought the breed into the media spotlight). I love everything about the breed, they have such big personalities for little dogs and they all have individual characters and personalities. 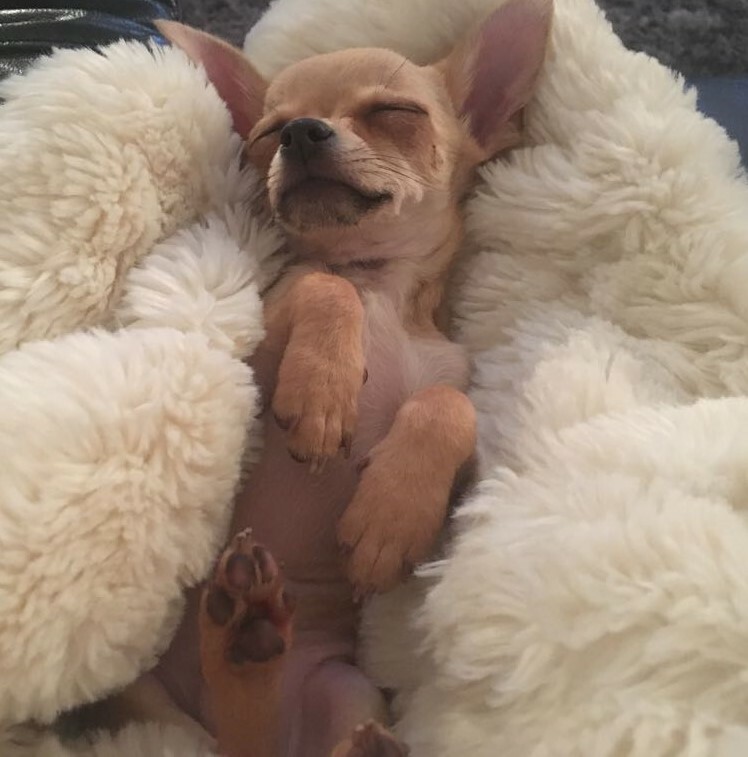 Chihuahuas all are so different too in terms of looks, sizes, coats, colours, unlike many a dog breed, each Chihuahua truly is an individual in more ways than one. I could not imagine not sharing my life with Chihuahuas, I am honestly devoted, nuts, loopy over them and my life revolves around them. Without my Chihuahuas my world would be an extremely sad and empty place to be. I would, personally, have had dogs in my life since birth but my mother hates dogs with a passion, and so we were never allowed a family dog as children growing up. That is probably why I now surround myself with dogs, perhaps it is a rebellious streak in me ? perhaps it is because I don't have children ? but whatever the reason, I wouldn't want my life any other way. We don't take holidays, we never leave the house together, to ensure that there is always either myself or my partner at home for the dogs, and I would never ever contemplate leaving them under another persons' responsibility and care for the sake of a week or two away, anyway, I would miss them and worry about them too much. They are more to me than just dogs. I look on them as my babies. Where my mother hates dog with a passion, I love them with a passion. We truly are complete opposites. But I would not change my views for the world, I truly believe that my mother is missing out on something special in her life big time, not having a dog, and not even wanting anything to do with dogs. But I find them such loyal companions, and they are always there to offer a paw or a cuddle, to stroke them is so therapeutic and they offer pure unconditional love (and they don't answer back! although I have to say some of my little divas do have the occasional paddy if they want something Right Now!) Yes, I do have 2 Chihuahuas in particular that will literally stamp their little front paws if they are not getting their own way. I can watch them playing together for hours, running around the house being daft. The way they dart around the garden reminds me of spring lambs, or when they go to the door on a wet and windy day and look at me as if to say "If you think I am going out in that you have another thing coming! ", those that do brave the cold wet ground do so with intrepidation and tippy toes, like proper little snobs! I just love it when they snuggle up under my jumper and stay their all warm and curled up for hours (unless I have to move), they are like little hot water bottles. Or when they burrow under their beds and peek out with their little eyes and noses at the world. Oh yes, and the way they sit quietly pretending that butter wouldn't melt, as good as gold as they watch you eat, knowing that any tidbits will only go to them if they are good, or the way they please themselves by hiding little treasures or treats with their noses, or throw toys off the couch so that they can retrieve them back and throw them off again. And a Chihuahua will shiver and shake just because they can, just because they are a Chihuahua. I can go on forever about their little habits and quirks, but just everything about them I find soothing, comforting, cute, funny and adorable. They really are the love of my life (after my partner of course!) and it isn't very often that they don't get their own way. Breeding Chihuahuas is not something that we ventured into lightly, as breeding can be heartbreaking as well as a joyful time, and due to the size of the breed, and the fact that this alone can bring breeding difficulties, and the fact that Chihuahuas can carry so many mixed up genes from imported breeders etc.. it is never something that should be done without a lot of thought and knowledge and research and experience. It really was a big decision to make. But we were both experienced with breeding other pets and animals long before we decided to breed my Chihuahuas, and undertook a lot of research prior to starting out. We also have an excellent relationship with our vet so if anything does go wrong, we know that we have medical backup along the way. We took our passion one step further to become an officially Licensed Breeding Establishment. I am registered with the British Kennel Club and my Affix is SedgysMiniMe. Sedgey (or CJ for short) was the name of our very first family pet dog. She was a Doberman and was with us from a puppy to the age of ten, when we sadly lost her to cancer. Losing CJ broke our hearts, as anybody who has ever lost a beloved family pet will know how that feels. 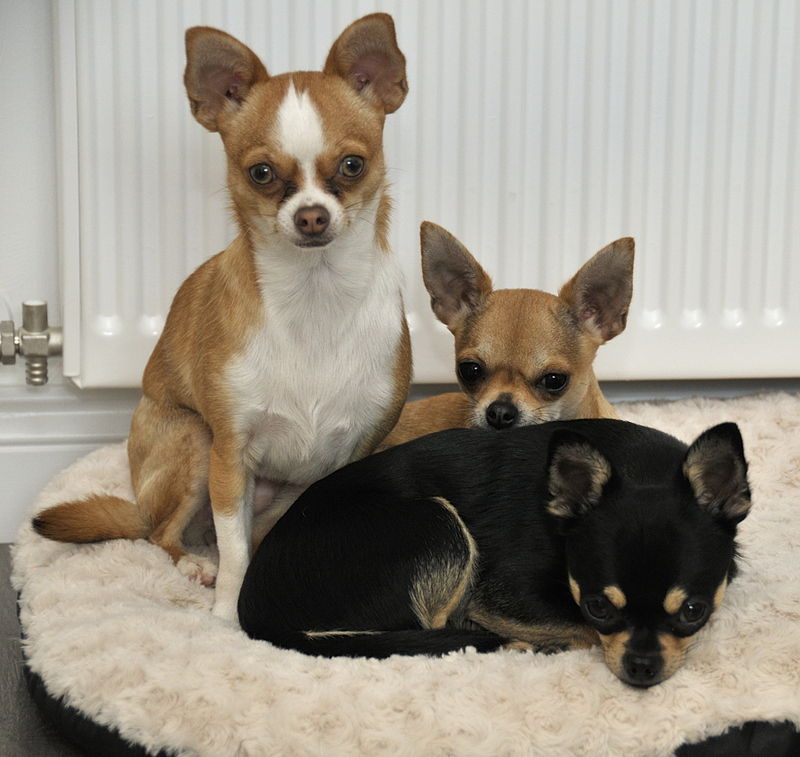 Thank goodness that we had our Chihuahuas to keep us going and see us through the difficult period in our lives. I am a breeder that cares deeply about where my pups may be going to live in the future, therefore I do ask a few questions, I apologise if you are not comfortable about this, I promise that I have only the interest of my pups' future in mind, and I want to be as sure as I possibly can be, that my pups are placed in the most suitable homes, and will be living in a loving, safe, happy and permanent environment, and that the potential new owners have really thought long and hard about the purchase of a new pup. Is there somebody at home through the day for a pup (and when the pup grows into an adult dog)? If not, what amount of time would/would not a pup have somebody at home through the day with them?. I am not able to sell a pup to owners who work full time, even if you plan a lunchtime visit. I am happy if two people share opposite shift patterns (for example), or if you work part time, or if you have close family/neighbours willing to share the day time care for the dog, or even if you are planning to use the facilities of a doggy day care, but if a pup/adult dog is going to be spending more than 3 hours per day, in any one day, on a regular daily basis, home alone, I am afraid that I am not able to help you. Are there young children living in your home?, If so, how many and what are their ages? Does anybody in your home suffer with allergies? Do you have any other dogs/pets?, if so, how many, what are they, what are their ages and temperaments? Have you ever raised a puppy previously? (don't worry if you havn't, I am just trying to determine what/if you have any experience of a puppy so that I can get an idea of how much advice/information you may need. Do you enjoy walks in the park/on the beach etc? What would be your plans for the pup/adult dog for times when you wish to go away on a break/holiday etc? Do you live in a rented property?, if so, does your tenancy allow you to keep dogs? If you need to obtain permission from your landlord to keep a pet, have you already obtained this? What kind of age bracket are you? If you are under 25, please provide your age, and/or if you live with your parent/s, are they aware that you are looking to purchase a puppy, and are they happy with the prospect of a pup living in their home? are your parents willing to help with the responsibilities of looking after a pup? is at least one of your parents (if you do live at home with your parents) willing to contact me, or happy to travel with you when you come to view a puppy/litter? Are you looking to purchase a puppy at the time you write to me, or are you looking to be added to my waiting list for a future pup? do you have a preference to the gender/colour/markings/coat of your new pup? Prior to contacting me, have you already discussed your desire to purchase a pup with your spouse/partner? Pups can cry/howl/bark/whine when they don't have your attention, they can cry during the first few nights until they settle in and bond with you, they can piddle on your best carpet, leave a little present of poo on your favorite rug, nibble on your table legs, scratch at your wallpaper, pee in your slippers, chew your best shoes. Puppies can be a real test of character and patience, have you considered how a few nights of no sleep might affect you? would you be worried about a crying puppy upsetting your neighbours? do you have a short fuse? are you obsessively house proud? Are you up for the challenge? Please do consider all eventualities before taking the plunge, Puppies are for life, they can live well into their teens, they should never be purchased on a whim, they should never be purchased as a surprise gift etc.. Are you Ready for a Pup? If so, Please do get in touch and I will be happy to help you choose the most suitable pup for your circumstances and lifestyle. Thank you for taking the time to read my above pointers. I promise I do not bite! I just want the best, and most suitable homes I can possibly find for my pups.